Written by an experienced machinist and plastic injection mold maker, this groundbreaking manual will have users thinking and producing like experienced machinists. 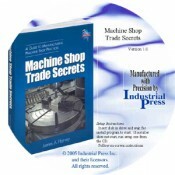 Machine Shop Trade Secrets provides practical “how-to” information that can immediately be put to use to improve ones machining skills, craftsmanship, and productivity. It is sure to be used and referred to time and again. • Select, make, and grind cutters. • Cut threads, knurl parts and eliminate warp. • Choose realistic feeds, speeds and depths of cut. • Remove broken taps, drill bits and other hardware. • Apply proven CNC techniques to maximize output. • Assist engineers with design and manufacturing issues. • Improve indicating skills and develop a “feel” for machining.